The Pinterest fad of using Sharpies on ceramic mugs got me wondering if it would work. And sadly, it didn’t. So I decided to try some products that were actually made for glass and ceramics. All of them were found locally in those national chain craft stores. I included an oil-based Sharpie, and a Silver Sharpie. The good news is that the products designed for glass and ceramics actually hold up pretty well through my washing, scrubbing, and steel wool tests. You can read about that here. All I had left to do was a dishwasher test, which would take a while. A quick summary: the stuff designed to work on ceramics and go through the dishwasher actually works pretty well! I left the test tile in my dishwasher for two weeks, running it through about 10 times. It’s a brand new dishwasher, an LG, that has a 2 hour run cycle. I used 1 Great Value dishwasher pack per cycle (why Great Value? It got great reviews in a consumer magazine — and it works great and is really inexpensive!). Some cycles were normal, some heavy, and some “quick” (meaning only about an hour and a half instead of two hours). After 10 passes through the dishwasher. I wish I had better pictures. But, I think it’s apparent that the Rainbow markers washed off after the first wash. To be completely fair, the markers clearly stated they weren’t dishwasher safe, therefore, they performed exactly as they said they would. Other than that, it’s pretty clear that the other media will do good to great in the dishwasher. The PenTouch Metallic pen stayed on quite well. It did shift colors a bit, becoming duller and less metallic. However, for a fun project that doesn’t need to last forever, it performs quite well. Other than the color shift, the paint is in great condition. The dull/less metallic color isn’t a bad thing…I’ve had other drinkware that has gold-tone printing fade like this. It’s not a bad thing, just a bit worn. The Oil Based Sharpie and the Silver Sharpie both performed fairly well. There seemed to be some wear on the writing, particularly where it had been abraded by the steel wool. That tells me that it should hold for a fun project until the paint gets a bit damaged from normal wear and tear, then it might wear quickly. The Porcelaine paints were outstanding. There seems to be absolutely no change. It looks like they’ll hold for a long, long time. I would use these on a project I’d like to keep for a long, long time. The Folk Art paints and the Americana Gloss Enamel paint performed great. The gold showed a slight color-shift, much like the PenTouch Metallic (and I think that’s a function of the pigments used to make gold metallic paints/inks). The other colors may be slightly faded, but not enough for me to recommend against them. In fact, based on this test, I was quite pleasantly surprised at how well a $2 bottle of paint performed. I’d use these on long-term projects. I’ve purchased plastic, glass, and ceramic drinkware that has faded more over the same 10 washings. Remember that in that blank space was a Regular Sharpie that didn’t make it through all the tests. The Rainbow Markers did a great job as a craft marker — something that I’d use for projects that aren’t expected to have a long life. In my opinion, the Porcelaine products are the best. The Folk Art and Americana Gloss Enamel paints are also quite nice. 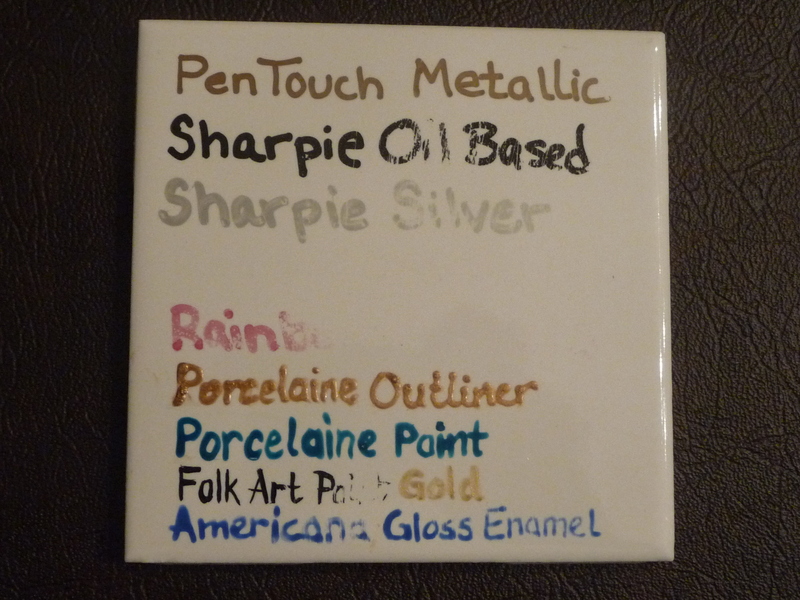 The PenTouch Metallic makes a lovely line, but does color-shift after repeated washings — not in a bad way, but it does shift. And the Oil Based Sharpie and Silver Sharpie makes up nicely, but won’t wear quite as well as the others. They are in marker forms, while the Folk Art and Americana paints require a paint brush. 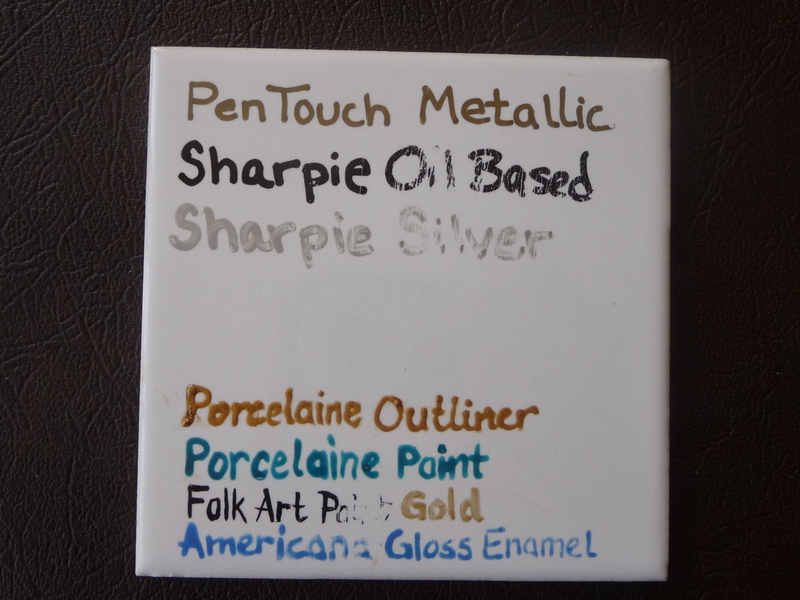 The Porcelaine paints are available in markers, though I haven’t tried them. All in all, these are some wonderful, readily available, inexpensive media to create your own dishwasher-safe decorations on glass and ceramic surfaces. Note: None of these products should be used on surfaces that will come in contact with food or one’s mouth. Avoid decorating the top rim of mugs and glasses, avoid the interior areas of bowls and plates, and keep the decorating to the handles of cooking, serving, and eating utensils. Please be safe! Posted in Crafts, General•36 Comments on Sharpies on Ceramics, Part III — Success! Wow, what a thorough test and write up. Thanks for going to such great lengths and even proving pricing info. I just completed a sharpie drawing on the ceramic tile and will see how it holds up after I’ve applied a sealer. It’s not going to be a coaster or cheese plate or trivet…just for decoration. We’ll see….can’t say I’m optimistic. Thanks, bk! Let me know how your ceramic tile decoration holds up. What kind of sealer are you using? Della, here’s the update to my sharpies on ceramic tile. I had 4 tiles, all had sharpie drawings with green, blue, orange, yellow, brown and black. One tile had two coats of spray shellac and two coats of rustoleum clear spray enamel. The other three had 3 coats of the rustoleum only. The tiles have been sitting on my patio where they get about 5 hours of direct sunlight. First, re: color fastness…black faded the least (and in some places very little) followed by brown. All the remaining colors lightened substantially…about three shades.I also had a light blue on one and it completely disappeared. I’ve washed them with dishwashing liquid and dishwashing brushes which are not near as abrasive as steel wool but what I think would be the most common washing method.All held up well. The best looking finish is the shellac + rustoleum as it retained the gloss shine. Rustoleum alone lost most of its glossiness and now is more of a matte finish (though it is a bit uneven which leads me to think the spray was actually thicker in some spots). one tile had a small imperfection in it and i could scrap the rustoleum off with my nail which also removed the sharpie underneath. The brushes and soap didn’t seem to make the mperfection larger, but the coating was very easy to remove with my nail. Lessons learned….multiple coats of shellac plus rustoleum spray enamel best. Multiple coats of rustoleum second best but my guess is would improve with each additional coating. Sharpie inks in the sun are not colorfast. In side, out of direct sunlight may not be a problem but I wouldn’t consider the pigmentation permanent. bk, thanks so much for posting the results! Sounds like a lot of work, and I bet they were gorgeous before they faded. I didn’t really consider how light-fast the pigment might be — that’s good to know that it appears Sharpies are indoor decor. I’m sorry they didn’t even last the summer for you! Did you put the coats of shellac on first, then the spray enamel? Or was the shellac put on last, allowing it to retain the glossiness? Yes, the steel wool is a pretty extreme abuse of the surface, but I thought that might mimic the effects of the decorated item having things dragged across it, bumped into it, and generally bounced around over a long period of time. If it held up to that, it would be pretty spectacular! You’re right, dishwashing liquid and brushes are probably more normal for cleaning purposes. I’m glad to hear the shellac and Rustoleum holds up well. Thanks again for sharing the results of your project! hey Della, spray shellac (bulls eye) first, then the rustoleum clear enamel. this combo didn’t lose the shine and actually faded less so than the enamel only tiles. thanks for the kind words, but the art work wasn’t anything special really, primarily for the test. Interesting! I would have thought the top coat would have dictated the sheen. Sounds like I need to play with some finishes! Thanks again for sharing your project results. Thanks so much for all your investigation. I’m getting married in October, and I wanted to have these little leaf tiles for my guest to sign, that I can later build a mosaic tree with. I began doing a trial, but thought, I wonder if anyone already knows? You saved me a lot of time and effort!!!!! Great job! Eva, your mosaic tree sounds like a terrific idea! I’d love to see a picture of it when complete. I hope I helped in some small way to have a lasting memento of your special day. Best wishes for your wedding! Thanks so much for your experiment. I was just about to use a sharpie on a special wedding bowl that I created for a friend. I am so glad that I found your post before making a big mistake. Glad I could help! I’d hate to see something as special as a wedding gift wind up not lasting. Did you use one of the other products to decorate the bowl or did you change your idea for the gift? Thanks for the article and the help! I’ve been wanting to do a “Giving Plate” for holiday cookies for neighbors. It was something I saw on pinterest which led to an already sold plate, but at least the pic was there so I could copy the beautiful poem on the plate about how you are supposed to pass the plate around to spread joy 🙂 I found your site on a search about sharpies on dishware. So glad I did! Now I will just make sure to add a note on the back about not putting food directly on the plate. I’m wrapping my cookies in a cute food grade plastic bag to put on top of the plate anyways, but I thought the plate was a great cheap way to give the cookies more meaning! Laura, the giving plate idea sounds lovely! Glad my articles could help start such a wonderful holiday tradition for a neighborhood. 🙂 Happy holidays, everyone! Thank you so much for your kind words, aliaa! I’d suggest the Pebeo products for long term projects. Why? Because I used them for some projects years ago, and the projects still look great today. That doesn’t mean the others won’t work well, but the Pebeo products I’ve used seem to be quality products designed for the particular application. Testor paints might work well; I didn’t think to try them (hmm…maybe I should!). For wood, I’d use any craft paint, like Folk Art, Americana, or Martha Stewart (among many others). Wood is nice and porous and accepts paint well. For fabric…depends on your use. If you want something decorative, like a wall-hanging that won’t be laundered much (if at all), you can give most any craft paint a go. If you want to launder it often, then use something geared for fabric. In that case, more of a dye would be better so it doesn’t change the texture or feel of the fabric. Pebeo makes some wonderful fabric paints. I’ve used their Setacolor paints (I think they’re still available at big box craft stores), and I was extremely pleased. They are quite colorfast. They also are able to be used to sunprint, which is pretty cool (maybe I need to do that for a blog entry? Hmmm!). I’ve got some other experience with fabric transfers, dyes, and paints, and I guess the best thing is to figure out the kind of project you want to do (paint large areas? Paint small details?) on what kind of fabric (cotton? silk? synthetic?) for what kind of purpose (wall hanging? pot holder? quilt? clothing?) and read the labels to see what is appropriate. I’m not sure any of the glass products are suitable for fabric at all, unless it’s a purely decorative piece — and then that leaves the Folk Art/Americana/Martha Stewart products. Perhaps I’ll visit some other media on different materials. Thanks so much for your feedback and compliments! Erin, that mug painting party sounds fantastic! Glad to know everyone had a great time! I’m in the midst of renovating my family room floor, so I’m a bit unable to find my test piece (it’s behind a few pieces of furniture that’s been moved out of the family room!). I’ll give it a try in a day or two and report back what I find. Thanks for your quick reply! I was thinking that having oven baked them would keep the design fairly safe, but I was wondering about the release of toxic chemicals into the air inside the microwave (and therefore the food or drink). I did shoot a note to DecoArt to see what they say. It’s hard to know how much would go airborne when it was heated that way. A few different bloggers that have articles on painting ceramics say that the mugs are no longer microwave safe once they’re painted, but with no explanation why, so I wasn’t sure if that was just a suggestion or not. I think asking DecoArt is the best idea. Please post back what they have to say! I’d love to know. Hallelujah! Thank you SO MUCH for this! I probably would’ve been pulling my hair out had I used a regular sharpie and seen my work of art get washed away. I’m so glad I can help out! Comments like yours make my day! This is awesome, thanks! I have one question though… I am working on a glass for a gift and made a mistake with the Sharpie Oil markers. Any suggestions on what I can use to remove it to fix it? Hi Sam! Thanks for the kind thoughts! As far as removing the Sharpie oil markers…how long has it been dry? If a short time (day or three), you can try using a razor blade much like you’d take excess paint off a window after you’ve painted the trim. If it’s a small, intricate area, look at various sizes of Exacto blades. If you want to use a liquid solvent, anything that works for oil paint should work, like turpentine or mineral spirits. Just a reminder to be patient and work slowly with cotton swabs if you’re trying to erase a small detail in the middle of your work. Moisten the error with the solvent, then wait a bit. Moisten again, wait again. Let the solvent dissolve the error, which can take time — hours, even. Keep it moist and it should finally be able to wipe it away. Too wet, and you risk the solvent spreading to the good part of the design! Great information! Just what I needed! Thank you. Thank you, Cathi! Glad you could use the information! Della, I have a small ceramic piece with shallow engravings. I want to fill the engravings with Pebeo Porcelaine 150 Silver Shimmer paint. I want maximum durability but baking the piece in an oven will prove to be difficult for various reasons. Have you compared the durability of baked and non-baked Pebeo 150 paint, not the markers? This piece will be handled quite a bit and I’m concerned that the oils from hands and cleaning products will degrade the paint. Jeff, I have not compared baked and non-baked Pebeo paint. I thought I remembered that you can also let it air dry for something like 30 days with the same durability, but I don’t see that on their website. An alternative that I remember from my childhood might be using Testor’s silver model paint. That stuff seems to bond permanently to whatever it touches, though I’m not sure how it will hold up through the dishwasher. If you’re doing light cleaning (spray cleaners or hand washing), that might work. I couldn’t find any info their site either. I even emailed them and asked about it and other things, twice, but that question was ignored both times. So you think Testers may be more durable for my situation? The piece will never go into the dishwasher but I am looking for maximum durability. Thank you so much for all of this information about your research concerning this topic. I can’t help but wonder about how they markers / paints on coffe cups hold up in microwaves for a minute or two (after they are finished baking,etc …). Many people will pop a cup of coffee or a plate of food into a microwave to heat up. Would they react and be a fire hazard if used in this manner (particularly those metallic paints) ? Have any research in this regard? Thanks for your feedback. I haven’t done any research at all on the ability to withstand microwaving (though it does sound interesting!). Like you say about metallic paint, I’d be hesitant. I think the best course of action is to look and see if the paint notes it’s microwave safe. (Same with dishwasher and food safe paints — and even with food safe, I’d still not put them where my lips would go on a glass/mug or on the surface that touches food for a plate or bowl). If it’s not explicitly stated that it’s microwave-safe, I can’t recommend using it for an item that will be heated in the microwave. Hi, i think this piece is GOLD ! Thanks so much for all the details.. you’ve cleared all questions one can have in mind on this .